LearnLab is an online presentation platform that enables teachers and lecturers to combine PowerPoint presentations with interactive questions. You can easily upload your PowerPoint slides, and organise them. 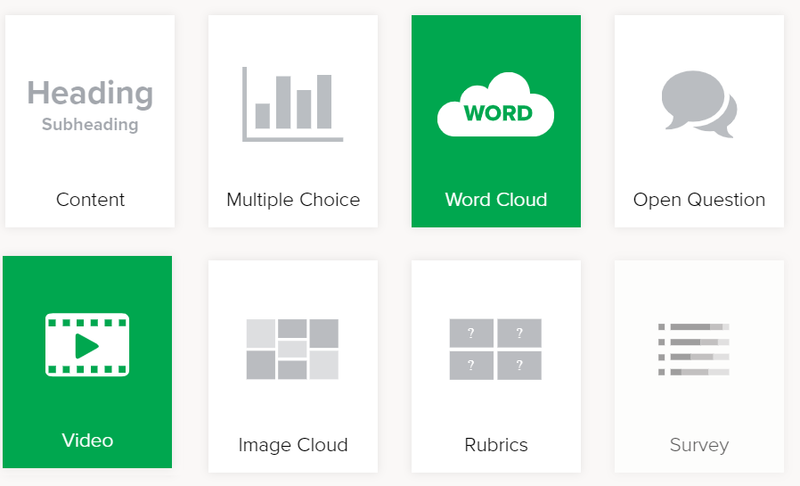 You can add slides with interactive questions that you would otherwise have created with a Student Response System such as; Socrative, Mentimeter, Smart Notebook Response System, or Kahoot. The advantage of LearnLab is that you do not have to switch between programs for content and interactive questions while presenting. LearnLab offers nine types of content. The basic content is uploaded from PowerPoint presentations, the other eight are shown below. Combines PowerPoint (1) content, and (2) interaction, through questions and responses in one program. LearnLab combines the variety of questions, and visualisations of the responses that can be found in Socrative and Mentimeter. LearnLab offers the possibility to work with a two-step interaction, namely first the question and thereafter participants can cast their votes or ‘like’. Some new multi-media features are available, such as upload of a picture by the participants which can thereafter be rated. Editing of content, such as font and layout, is limited. You cannot present a picture with the question. The videos in your uploaded PowerPoint presentation do not work any longer, so you have to create new slides for them in LearnLab. You lose all animations, hyperlinks, actions that were built in the PowerPoint. You have no control over how to stop and close a LearnLab session. You can activate a new lab session, but it remains unclear which lab session you have activated and how to deactivate it. Participants cannot delete sessions themselves. They remain visible. Participants have to open a browser, there is no App available for answering the questions like with Socrative. LearnLab does not provide the option to let participants work through questions at their own pace. LearnLab is a nice and useful tool for presenters and lecturers, because it can enhance interaction and participation. For use in a classroom it is important to realize that the tool supports teacher-centered learning, not student-centered learning. Socrative is one of the best known responseware programs. We wrote about another responseware program Kahoot earlier. The teacher or presenter designs and starts a quiz on his/her computer. The students can access the quiz on their PC, tablet, iPad or smartphone. The students see the question and can answer. The results are presented graphically can be viewed and shown by the teacher. Socrative is suitable from primary school level up to university. You can use Socrative to assess knowledge and skills, but you can also use it to engage students using open questions, using it as a tool to gauge prior knowledge, or to vote in a poll. DiScoro offers workshops in the use of Responseware, such as Kahoot, Socrative, and in how to create various types of questions. Socrative has several options: Quiz, one single question, and Space Race (competition). It takes very little time to start and use Socrative with students. Socrative offers Multiple-choice questions with the possibility to indicate more than one correct answer. Socrative offers the option to enter open questions where the student writes down his/her own answer. You as a teacher can select a student-paced or teacher-paced quiz. You can add feedback or hints that will be shown to the students after they have sent in their answer. You can upload a picture/graphic with a question, but this is optional. Students do not have to be present at the samen location as the teacher, because the students view the questions as well as the answer options as soon as they open the quiz. The graphics do not always work well when students use the program on a smartphone. You will find additional functionality and options, which you should check out for yourself. Désiré heeft reeds in 2001 als adviseur en auteur meegewerkt aan de online educatieve site This is a Journey Online. Een educatieve en interactieve website waarin communities van jongeren met elkaar samenwerken. De website staat in het kader van Duurzame Ontwikkeling. Jongeren van 13 t/m 16 jaar leren over andere culturen en landen en communiceren daarover met elkaar. Deel thema’s zijn onder meer water, voedsel, gewoonten, infrastructuur, en dagelijks leven. De site is in het Engels. Het materiaal werd gebruikt door scholen in Zimbabwe, Indonesië en Nederland. Jongeren kunnen vragen insturen, zelf verhalen plaatsen en deelnemen aan discussies. Het doel is het ontwikkelen van een action plan, waar jongeren voorstellen doen in het kader van duurzaamheid.